When Super Bowl LIII wrapped up earlier this month, the New England Patriots walked away, once again, as champions. The Pats’ win ended the suffering of the Boston faithful who had gone a whopping 90 days since the city had seen its last championship (the Red Sox World Series triumph). The key to the win? Great defense. Despite a sub-par performance by Tom “Don’t call me Mr. Bundchen” Brady, the stout defense held the second-highest scoring team in the NFL to a mere three points. . . a big-time performance on the biggest stage of all. The game’s other big winner was the NFL itself, having captured a record amount of Wi-Fi traffic. Extreme Networks, the official Wi-Fi analytics provider of the Super Bowl and NFL since 2014, provided me the details of the data. The 24.05 terabytes of data transferred over Wi-Fi smashed the 16.31 TB from Super Bowl LII. In fact, since Extreme began gathering data in 2014, each year has seen a significant jump in traffic volumes. Another record for Super Bowl LIII was that almost 49,000 fans, or 69% of people in the stadium, connected to Wi-Fi. 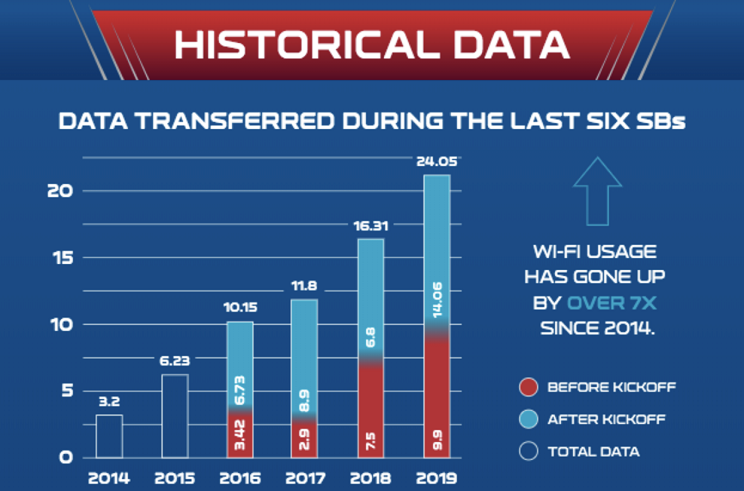 The number of concurrent users has grown steadily since 2014, when only 16% of fans connected to Wi-Fi in Super Bowl XLVIII. Since then, the percentage of fans connected grew to 25% in 2015, 42% in 2016, 49% in 2017, and 59% in last year’s big game. Apple iCloud was the largest source of data, transferring 10.8 TB of information across Wi-Fi. I’m guessing this data came from fans uploading videos and photos of their favorite moments to the cloud. Social data jumped 9% to 2.83 TB, with Instagram and Facebook each consuming about 1 TB of data, SnapChat consuming 463 GB, and Twitter at 317 GB. Some of you may be wondering why this data is important. Who cares if the data gets sent over Wi-Fi or the LTE cell network? The key lies in the ability to turn the data into actionable insights to create a differentiated fan experience. Over the past few years, the NFL has gone as crazy over data as the New England fans have gone over anything TB12-related. Good data leads to good insights, and the NFL can use the information to understand how to create a better fan experience. Given this year’s data, the NFL might start prioritizing the pushing of stats, ads, promotions, and other information over Instagram and Facebook and rather than SnapChat and Twitter. Or maybe it works with Twitter to create more engagement there. The key is, it has the data to make the right decisions. This is a lesson that all business and IT leaders should heed. Success in the digital transformation era is based on creating unique and differentiated customer experiences. This requires the collecting of information, much of which can be gathered from data that traverses the Wi-Fi network, and that makes a good, solid, and reliable Wi-Fi business service critical. To continue with the Super Bowl theme, the Wi-Fi network needs to perform well on the biggest stage and for most companies, that’s not once a year, it’s all the time. I’ve talked to many organizations that have had their digital transformation projects scuttled because of problems with Wi-Fi. For example, a retailer rolled out a mobile app to track in-store shoppers so it could better place merchandise. But Wi-Fi was so bad, customers turned it off and used LTE instead. In another example, a hospital wanted to send patient telemetry information to clinicians’ mobile devices. But those alerts encountered so much latency and packet loss across the Wi-Fi network that they were either so delayed or lost all together, putting patients at risk. Then there was a school that wanted to use tablets as a way of changing the way students learn, but the tablet program flopped because the Wi-Fi infrastructure was too old. In each of these cases, the digital project had the opportunity to create new experiences, but the poor Wi-Fi caused the project to fail. As I’ve in previous posts, the most successful companies in the digital era will be the ones with the most data and the machine learning algorithms for connecting the dots and discovering hidden insights. Wi-Fi data is a big part of that. The key is to have a Wi-Fi network that can stand up even during the busiest times. I’m sure most of you readers have been at a conference and before the keynote have been able to email, Tweet, post to Facebook, and do other tasks. Then the first speaker takes the stage and everything goes to pot, and you have needed either to revert to LTE or not use your mobile device. In either case, the inability to use Wi-Fi is a lost opportunity for the venue, company hosting the event, and other constituents. With today’s technology, enterprises have no excuse for poor Wi-Fi. If the NFL can accommodate 49,000 fans in a single venue, every airport, retailer, hospital, school, hotel, casino, and other business should be able to offer high-quality Wi-Fi 100% of the time. CIOs need to work with their line-of-business counterparts to make this a priority. Those companies that do will have better success with digital projects and leapfrog those ignoring Wi-Fi because in today’s business climate, good-enough Wi-Fi is no longer good enough.